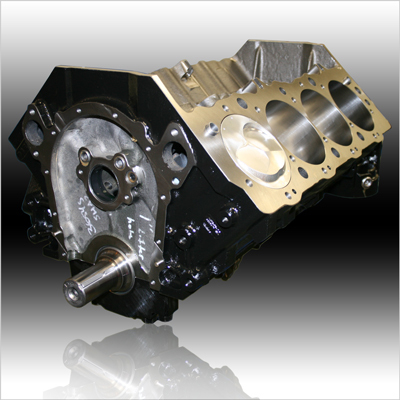 Take One Of Our Balanced Rotating Assemblies And A Fully Precision Machined And Race Prepped Block, Have It Assembled By The Most Experienced Race Engine Builders In The World And You Have All The Components That Make Up One Of The Best Values In Short Blocks Today. (1) Machined and finished in USA with ARP L19 bolts as per our request. Includes: Custom Steel Billet Roller Cam, Rollmaster Billet Timing Set w/IWIS Chain & Torrington Bearing, Official GM Performance Chrome Timing Cover, Cam Button And ARP Cam Bolts. Camshaft Installed And Degreed, Cam Button Shimmed To Installed Front Cover. Includes: Custom Steel Billet Roller Cam, Rollmaster Billet Timing Set w/IWIS Chain & Torrington Bearing, Cam Button & ARP Cam Bolts, Chrome GM Timing Cover And Tavia Pointer, SFI Harmonic Balancer, Moroso Custom Pro Eliminator Steel Stroker Pan w/Louvered Tray and Main Cap Partitions, Moroso Oil Pump & Severe Duty Tig-Welded Pick-Up. All Gaskets, Seals And Hardware. Completely Assembled With Camshaft Degreed And TDC Verified And Set.